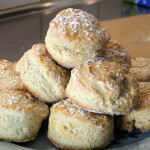 Warm freshly baked scones can be a real treat. Since they don’t need any time for raising they can be make in just a few minutes. What a great treat for breakfast or an afternoon snack. 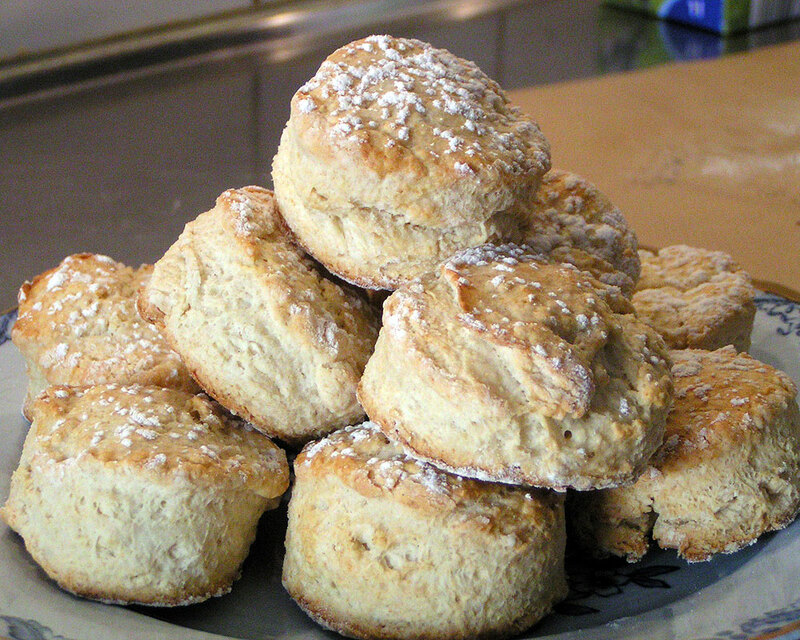 This is a recipe for simple and quick scones. This is a basic recipe for scones. You can add a few grams of cheddar cheese or a little finely chopped herbs or nuts to change their flavor. In a bowl with a sieve placed in it add all the dry ingredients and sift together. In a small bowl mix the yogurt and the milk together. In the bowl with the flour break up the butter into small pieces and rub it into the flour between your fingers. You are looking for something that looks like cornflakes. The mixture will be dry. Turn out the contents onto the counter and bring it together by pressing the mixture together. Turn it and do this 3 or 4 times until it comes together. Don't worry if its a bit crumbly it should be that way. With a rolling pin, roll out the dough until its 2.5cm or 1 inch thick. Use a large cutter (5cm or 2inches) to cut out rounds. Gather up the extra and again press it together and you will be able to cut out a few more. Place the scones on a baking tray lined with baking paper. Bake in a 220°C or 425°F oven for 12 to 16 minutes. Scones and muffins have one thing in common, you mustn't over work the dough. If you do the scones will be tough just like overworked muffins. I have been using this recipe for quite awhile and I got it from Delia Smith. Don't be afraid to experiment with this recipe, a teaspoon of finely chopped rosemary or thyme can make these a savory. Finely chopped walnuts or hazelnuts are also very good. I could also recommend raisins, finely grated cheddar, or some finely crumbled up feta.